During the month of June 1980, tenor saxophonist Illinois Jacquet recorded an LP with a group composed of 73-year-old trombonist Vic Dickenson, pianist Barry Harris, guitarist Gray Sargent, bassist Slam Stewart, and drummer Grady Tate. Mature and full of stamina, Illinois sounded more than a little like Coleman Hawkins did during his glorious protracted sunset in the late '50s and early '60s. 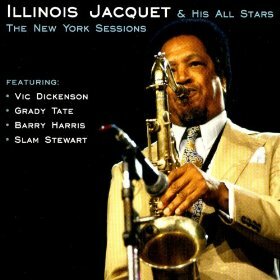 Originally released as Illinois Jacquet With His All Star New York Band, this excellent album was reissued (with two bonus tracks) in 2007, carelessly retitled The New York Sessions, as if Jacquet had never previously worked in New York City. This is mainstream jazz at its very finest; the solo sequencing is intelligently varied and the sound mix is luscious, especially as engineer Phil Clendinnin gave Slam Stewart's bass a healthy boost for old time's sake. 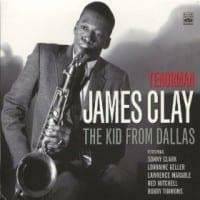 "Bow Jest" begins and ends as a feature for Slam's singing/bowing technique, and "G Baby" is a languid, laid-back ten-minute hunk of blues that must be one of Jacquet's all-time heaviest excursions in the idiom. The standards -- including a brisk 13 minutes of "Lover Come Back" -- are excellent, double takes and all, but "G Baby" is worth the price of admission all by itself.